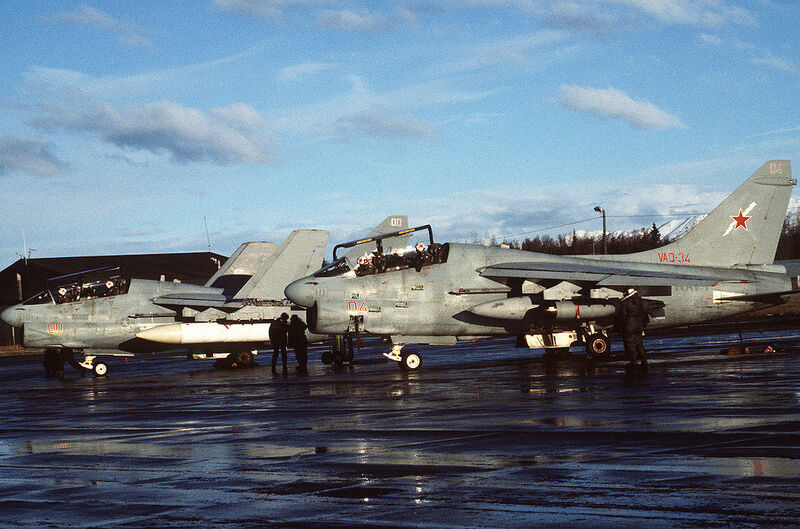 Two of the most famous U.S. Navy attack aircraft, the A-3 Skywarrior and the A-7 Corsair II played also the role of adversary aircraft. 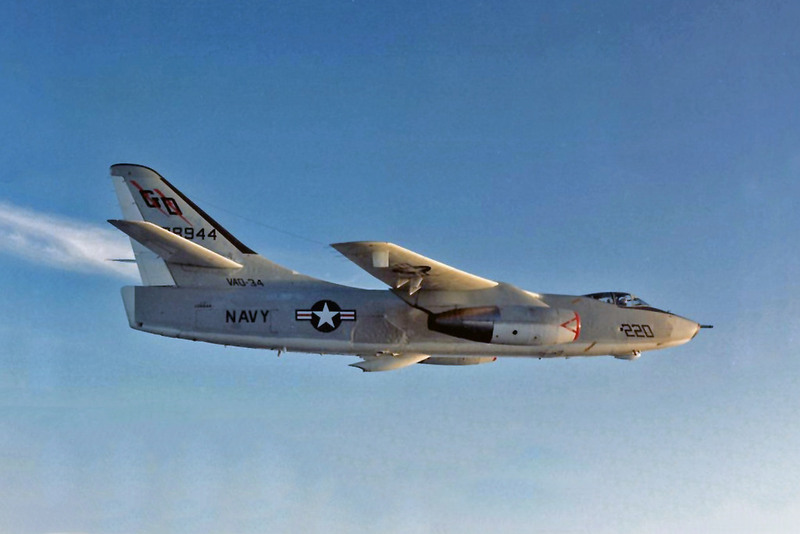 Dedicated versions of the Skywarrior and Corsair II in fact, the RA-3B and the EA-7L , served in Tactical Electronic Warfare Squadron 34 (VAQ-34) within the Fleet Electronic Warfare Support Group (FEWSG) to simulate Soviet aircraft, often carrying a variety of jamming and ECM pods. 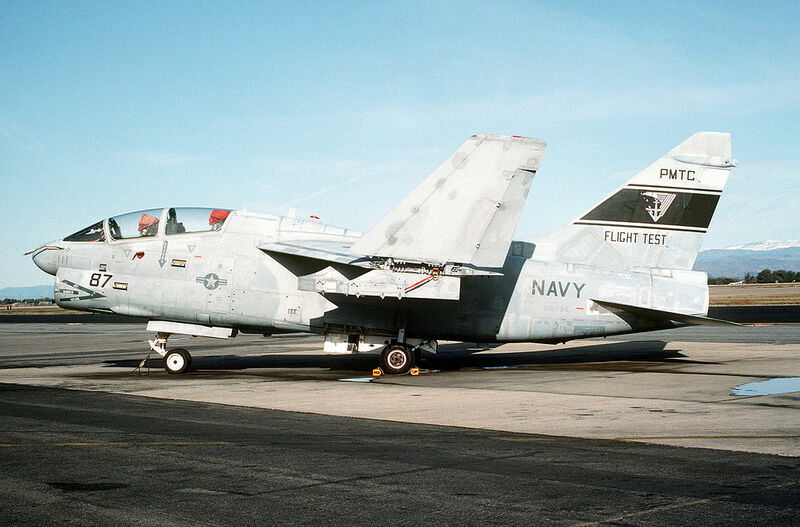 His claim was confirmed by Rich Affeld who was the XO of the VAQ-34 when the Squadron stood up. ‘Joe Hawkins is correct; it was never the “Electric Horsemen.” Call sign was always “Flashbacks.” First patch had a background of orange air, since that was our usual role – as the air arm of the Orange force. Pegasus was used by Zeus (king of the Greek gods) to carry his lightening bolts. The red star was directed by RADM “Bear” Taylor , when he was Commander, Light Attack Wing Pacific, to be the equivalent of the aggressor squadrons training Top Gun & Strike U. Some guys at a Navy publication came up with the Electric Horseman moniker in a story about the squadron. 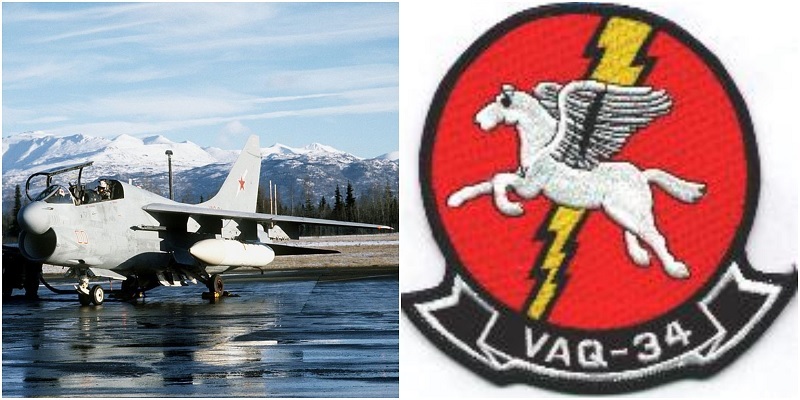 Further details on VAQ-34 original logo are provided in the following official US Navy Press Release from 1987. “Soviet red stars have been spreading like wildfire at Point Mugu. Tactical Electronic Warfare Squadron Thirty Four (VAQ-34) the Navy’s west coast aggressor squadron has received permission to totally redefine its image. As an aggressor squadron – one of only two in the Navy with the specific mission of utilizing electronic warfare tactics in training exercises VAQ-34 plays the role of hostile forces in training other Navy units. To more accurately reflect that role, the squadron is changing its aircraft tail design from two lightning bolts to the most recognizable potentially hostile forces logo -that of a red star trimmed with a white border. The ‘whole line yards” consisted of changing the units logo, which adorns the squadrons hanger and appears on doors throughout the buildings. It is also used on memorabilia such as patches, t-shirts, nametags and stickers. The squadrons logo had been based on the Greek mythological character Dellerophon, who triumphantly rode Pegasus into battle. The logo was Pegasus and a lightning bolt on a field of orange, the color signifying enemy forces in war games. The new logo, designed by Airman Ireneo Espiritu (Oxnard) centers on the white – trimmed star on a field of red, white, and blue. The streamers stars Are those of the United States, and the red and white Stripes at the bottom signify the stripes of the U.S. flag. The Russian words at the top of the logo translate to EW Aggressor, the role of electronic warfare aggressor that the squadron plays in training. The missile represents an aggessor being acted upon by electronic warfare, the lightning bolts of VAQ-34.